Just like Nokia and its Asha range of features phones, which aim to bring smartphone-like functionality at a much lower pricepoint, Vodacom is looking to introduce smartphones to the South African masses via the Vodafone Smart Mini. The Smart Mini costs a mere R900, making it one of the most affordable and accessible smartphones on the market. As with Samsung’s Galaxy Pocket (review), a price point this low equates to some pretty unassuming looks, meaning large dollops of drop friendly plastic that renders it sturdy but not particularly attractive. 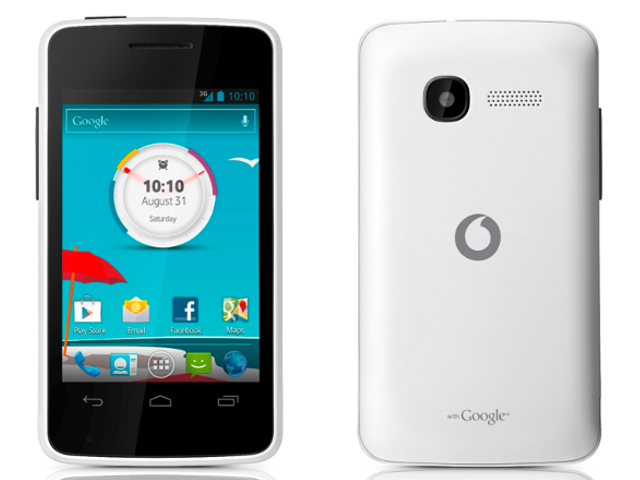 Vodafone’s Smart Mini packs a 3.5" (320 x 480; 165 ppi pixel density) TFT capacitive touchscreen, which is the same size as that of the iPhone 4 (review) and 4S (review). However, size is where that comparison ends since the Smart Mini’s display is definitely not the slickest, nor most responsive touchscreen, nor does it sport the best viewing angles either. We did find that the resolution and pixel density are both quite good considering that most other budget handsets we have reviewed offer inferior screens. This includes the LG Optimus L3’s (review) 3.2" (240 x 320; 125 ppi) display, as well as the Galaxy Pocket’s 2.8" screen (240 x 320; 143 ppi). Vodafone's Smart Mini sports an unassuming, two-tone (black front, white back) design and a not too shabby (for this price point) 3.5" display. Like the design, the specs of the Smart Mini will not exactly set the budget smartphone segment alight seeing that it is powered by a MTK 6575 chipset, which features a single-core 1 GHz processor that is coupled with 512 MB RAM. This union does not exactly deliver blistering performance with the almost stock Android 4.1.1 (Jelly Bean), but should be smooth enough for users who need to browse the web, get their email, keep in touch using SMS, MMS, various IM chat clients and social networking apps. In terms of optics, you only get a 2 MP camera which takes some poor quality shots that lack detail. Images taken with this snapper also pixelate the moment you dare pinch-to-zoom in on them for a closer look at your subjects, and the camera is virtually useless at night. Buyers receive 4 GB worth of internal storage for their photos, videos, apps, and games, but you are able to expand upon this by as much as 32 GB via a microSD memory card slot. The Smart Mini also boasts the latest version of Bluetooth, namely 4.0, Wi-Fi 802.11 n, HSDPA connectivity, and an FM radio. Vodafone’s Smart Mini smartphone makes Android Jelly Bean and all the hundreds of thousand of apps available on Google Play available at a much lower price-range. The specs and design on offer might not make headlines, but are good enough to persuade feature phone users to take the next step to smartphones. Entry into the smartphone world does not come much more accessible than the R900 recommended retail price of the Vodafone Smart Mini. Access to Google Play and its hundreds of thousands of apps and games. Runs on almost pure version of Android Jelly Bean. Looks and feels as cheap as it is. Not the best performance ever encountered on a smartphone. 2 MP camera takes poor shots. Very affordable; sturdy build; access to Google Play and its hundreds of thousands of apps and games; and runs on almost pure version of Android Jelly Bean. Looks and feels as cheap as it is; not the best performance ever encountered on a smartphone; and the 2 MP camera takes poor shots.